Obituary of Herbert O. Reid Sr., civil rights attorney. Herbert O. Reid Sr., 75, legal counsel and key adviser to former D.C. mayor Marion Barry and a former acting dean and constitutional law professor at Howard University law school, died of cancer yesterday at George Washington University Hospital. Reid also was a leading civil rights lawyer who participated in several landmark cases that helped dismantle racial segregation in public facilities. Those included the 1954 Brown v. Board of Education case in which the Supreme Court declared segregation in the nation’s public schools to be unconstitutional. He helped argue then-Rep. Adam Clayton Powell’s case against his 1967 exclusion from the House of Representatives, winning a 1969 ruling from the Supreme Court that the barring of the Harlem Democrat from the House was unconstitutional because he met all legal requirements for the post and had been duly elected. But in recent years, Reid was best known as a major player in the Barry administration and the mayor’s foremost personal troubleshooter. The two men met during the 1965 civil rights demonstrations in Selma, Ala., and they became close friends when Barry came to Washington as an organizer for the Student Nonviolent Coordinating Committee soon after. As an influential figure in Barry’s inner circle, Reid served as point man for the mayor in several sensitive areas. He was acting corporation counsel from 1989 until Barry’s final term as mayor ended in January. As the mayor’s personal counsel, he looked after Barry’s interests during investigations that led to the convictions of high-ranking and mid-level D.C. government employees, including former deputy mayor Ivanhoe Donaldson, of crimes related to their official duties. In this role Reid often clashed with the U.S. Attorney’s Office, angrily accusing prosecutors of leaking to the news media information derogatory to the mayor. But he did not represent the mayor in his trial last summer on drug charges. That defense was handled by R. Kenneth Mundy. Reid, who lived in Washington, was born in Wilson, N.C., and graduated from Howard University. He served in the Army during World War II and received a law degree from Harvard University law school. He joined the law faculty at Howard in 1947, and held an endowed chair there as the Charles Hamilton Houston distinguished professor of law. He was acting dean of the law school from 1972 to 1974. He retired from the Howard faculty in 1988. His years at Howard covered a period in which top black law students came to be aggressively recruited by the nation’s prestigious mainstream law schools, which previously had been cool toward the admission of minorities and women. He was acting dean during a time of student protests and a boycott that followed an increase in failing grades. In the face of this development, Reid insisted that Howard should continue to maintain high academic standards, despite the loss of some top-ranking students who might otherwise have enrolled at Howard. In the late 1950s, one of his law students at Howard was a young Army veteran of the Korean War from Richmond named L. Douglas Wilder, now governor of Virginia. Once, when Wilder showed up for class hung over from a night on the town, Reid called him aside. Thereafter, Wilder buckled down and passed all his courses, including Reid’s. While on the Howard faculty, Reid also was special counsel for the NAACP. In this capacity he took on a variety of civil rights cases that included defending the rights of poor tenants to improve their living conditions through rent strikes and the defense of seven persons arrested in a 1966 White House sit-in to protest racial injustices in Selma. He served on a private commission that investigated relations between the nation’s police departments and the Black Panther Party during the early 1970s. Reid also served on the board of trustees of the University of the District of Columbia. In this role he undertook the defense in 1985 of then-UDC President Robert L. Green, who was under fire for misuse of university funds for travel, consulting and sending flowers to personal friends. Green eventually resigned. Reid’s marriage to Ann Thompson Reid ended in divorce. Survivors include his companion, M.L. Carstarphen, and a daughter, Carlene Reid Funn, both of Washington; and a grandchild. A son, Herbert O. Reid Jr., died last month. Washington Post, 15 June 1991. Herbert O. Reid Sr., a prominent civil rights lawyer and a longtime adviser to former Mayor of Washington, Marion S. Barry Jr., died of prostate cancer on Friday at his home in Washington. He was 75 years old. Mr. Reid, who served on the faculty of the Howard University School of Law for 41 years, also taught many of today’s black leaders, including the Governor of Virginia, L. Douglas Wilder, and the current Mayor of Washington, Sharon Pratt Dixon. Mr. Reid was a participant in several legal cases that led to major Supreme Court desegregation rulings, including Brown v. Board of Education in 1954, which ended the practice of segregation in public school systems. In the late 1960’s, he assisted in the defense of members of the the Chicago Seven against contempt of court charges and in former New York Representative Adam Clayton Powell’s legal battle to regain his seat in Congress. In recent years, Mr. Reid was best known as a high-level adviser and mentor for Mr. Barry. The two met at a civil rights march on Selma, Ala., in 1965. Mr. Reid was born in Wilson, N.C. He was an honors graduate of Howard University in 1940 and completed his legal studies at Harvard University School of Law. In 1945, after serving in World War II with an all-black New York National Guard regiment and fighting in Okinawa, he became the first black clerk at the Massachusetts Supreme Court. 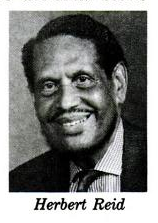 Mr. Reid joined the Howard University School of Law faculty in 1947 and served as acting dean from 1972 to 1974. He retired from there in 1988. He also served as a special counsel for the National Association for the Advancement of Colored People and on the Board of Trustees for the University of the District of Columbia. His marriage to Ann Thompson Reid ended in divorce. His son, Herbert O. Reid Jr., also a lawyer, died last month. He is survived by his companion Mary L. Carstarphen, a lawyer; a sister, Thelma Reid Whitehead; a daughter, Carlene Reid Funn and a grandchild, all of Washington. New York Times, 16 June 1991. Photo, Jet magazine, 22 October 1990. In the 1920 census of Wilson, Wilson County: Judge D. Reid, 47, wife Elenora P., 41, and children Bruce P., 17, James D., 15, Thelma R., 11, Carl F., 7, and Herbert O., 4. ← Dr. Frank S. Hargrave. Lisa, Every time I visit your blog I learn something new. What I’ve discovered is that so many African American Wilsonians have made a lasting mark on the world, yet most native Wilsonians probably have no idea. This is amazing! Your blog is on my list of daily must reads. Thanks so much for your dedication. That’s very much how I feel, Sharon! I’m constantly amazed. Thanks so much for your support!